Video: Go behind the scenes at Rega's factory | What Hi-Fi? Rega’s founder, Roy Gandy, is up-front about the company’s philosophy. “It’s an engineering company, run by engineers, who happen to like music equipment,” he says. And once you’ve seen what goes on in the factory, there’s no disputing it. Whether it’s the painstaking process of splicing wiring looms or assembling moving-magnet cartridges, or putting the final polish on a top-end turntable, everything the company does is shot through with that passion for precision; that fanatical pursuit of quality. There’s more to the company than just turntables. The range includes amplifiers, DACs, phono stages, speakers, electronics and more, and Rega’s skilled engineers even design and machine the tools they need to make that range. “It’s a haven for people who like to make things with their hands,” says Gandy. For instance, there’s only a handful of people on the planet who can perfectly wind a moving-coil phono cartridge. 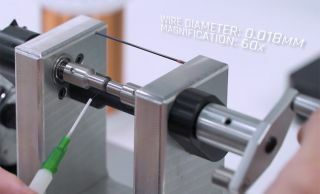 (The wire is just 0.018mm thin – break it and you have to start again.) Rega employs three of them. “The secret is good parts,” he says. Bearings. Spindles. Motors. Capacitors. Wiring splices. Every component is hand-picked because it’s the best available – and many of Rega’s suppliers are local, because that’s a great way to keep tabs on quality. You can build a system from source to speakers, via cables and interconnects, using nothing but Rega products – all designed and built in-house in the company’s Southend facility. So, when you’re listening to it, take a moment to think about all the skill and pride that went into making it. There’s no way you won’t smile.